I'm not obsessed with Journey into Imagination. There I said it. You might think me a lesser Disney fan for saying it but it is true. I have never and will never see Figment and Dreamfinder in their glory. 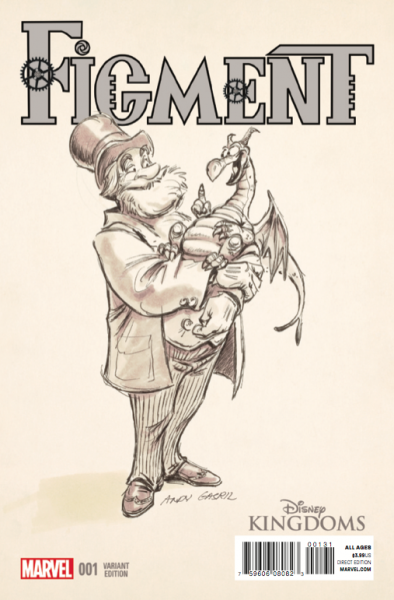 I enjoyed the book From Dreamer to Dreamfinder, but I am not really the target Disney fan that Marvel and Disney are trying to reach with Disney Kingdoms second comic offering Figment. 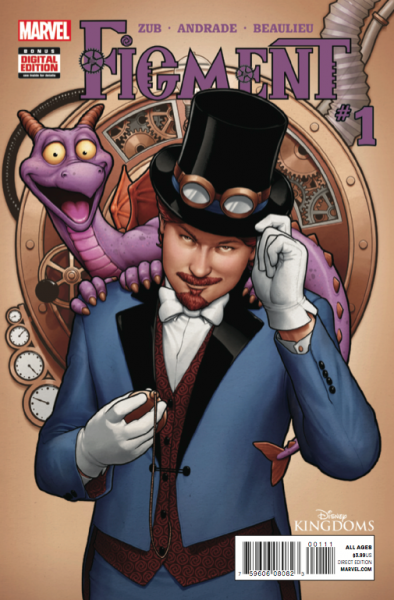 Figment #1 written by Jim Zub with art by Felipe Andrade introduces us to Blarion Mercurial, a young man with some facial hair that we could imagine eventually sprout into Dreamfinder hairy greatness. Mercurial works for the Academy Scientficia-Lucidus in 1881 London and has been charged with discovering new forms of energy. He creates the Integrated Mesmonic Converter which makes energy from brain power. However, his employer doubts his creation and threatens to send him back into the arms of his childhood poverty. In experimenting with his machine he unlocks his own memories and imagination, re-introducing himself to an old friend! In the final pages his experiment is interfered with and he begins a journey that looks to shape the young man. Here just let me say it, I liked it! 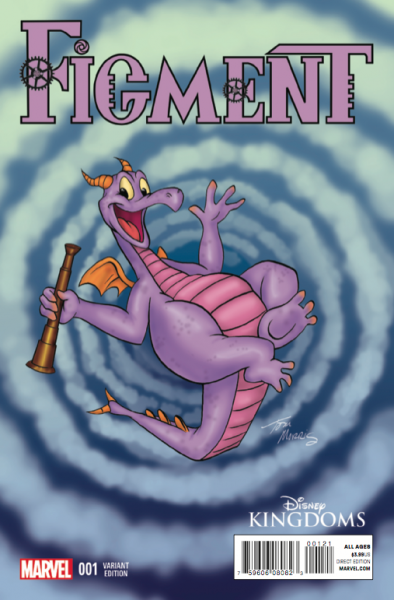 Figment was a well-written, beautifully illustrated tale that I felt achieved exactly what it wanted, part one on a heroic adventure of discovery. I liked the 19th century setting and found the art a good mix. I have heard many say the previews had a steampunk look. But I felt like the steampunk aspects, like a owl like helmet, were not forced but were a natural part of the story set in our world. And even though I am not in fanboy love with Dreamfinder or Figment, I found myself feeling connected to Mercurial. And I could not help but hear Billy Barty's voice when Figment spoke. I thought it was a huge success with my only major criticism being a lack of creator credit for Tony Baxter and Steve Kirk. What I am really enjoying about this Disney Kingdoms series is the all-ages aspect of a comic. This line is not bloody and something that I can share with my kids. And the Between Tween really likes Figment from a past trip to Epcot. The Tween also came to connect to Mercurial, and I do wonder if we should consider this story canon for the origins of Figment and Dreamfinder. And the Tween really liked the fact that Mercurial blew some stuff up! I joke around with my local comic shop guy quite a bit. So when he saw me put down three issues of something called Figment he began to tease me. I noted it was Disney, which lead him to fly to the shelves to pull a copy for another regular who buys all Disney! And he quit teasing me realizing that Figment is a beloved pop culture icon. He did not realize what he had when the title went out! Why three? I was buying two for none comic fans! I hope Marvel is taking note that some non-regular customers are buying these books. The Tween said it all with, "That's it, you can't stop me there." Figment was really enjoyable and I look forward to next month's installment! This is the sort of title that makes me realize all the fun that Marvel can have with Disney's characters and not just how much fun Disney will have with Marvel's! Between Books - Who's the Leader of the Club? Dreaming Disney - Dole Whip Rides Again!